Encyclopaedia Metallum: The Metal Archives • View topic - HYPERSPHERE - Melodic/Progressive/Ambient Metal with musicians from around the world! HYPERSPHERE - Melodic/Progressive/Ambient Metal with musicians from around the world! 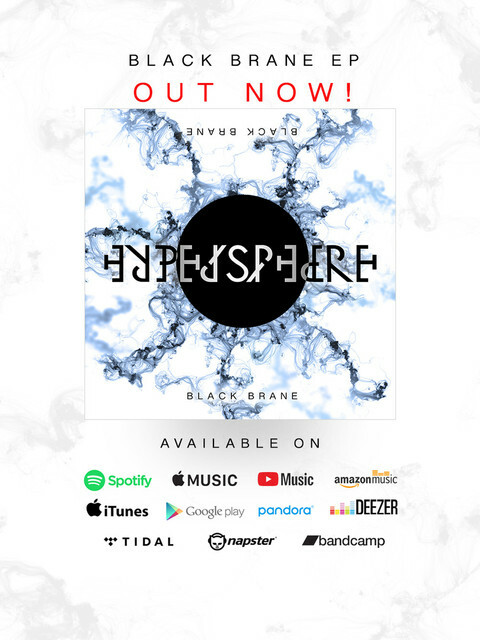 We are a new internationally based metal project called Hypersphere, and we have recently released our first EP entitled “Black Brane”, available to stream in most music streaming platforms, including Bandcamp! Enjoy it! Hypersphere is a musical project created by Canadian/Mexican-born guitarist Gustavo E. Rather than a band, Hypersphere is a project that consists of musicians from different parts of the world. The most recent EP consists of musicians from France, Canada, Germany, Romania and USA! As a matter of fact, none of us have met each other in person! The most recent material, which was released January 31 2019 is called “Black Brane”, a four song EP incorporating elements of ambient, symphonic, industrial and progressive metal. “Black Brane” explores themes such as human behaviour, the human mind, multiple dimensions and the multiverse theory. Awesome! I listened to the video not expecting much, so my apologies! This blew me away, the whole thing sounds awesome, vocals are what I was looking for. Hope you guys put out more music! I tried submitting you to the archives after seeing the release on Bandcamp, someone else beat me to it though. Hey Diabolism, thank you so much for your support! For sure we will put out more music for everyone to hear, our latest EP is the beginning of something bigger! Don’t hesitate to share our music and recommend us to everyone! Thanks again!